NICOLE RICHIE NEWS: Joel Madden - "Fatherhood has given me a different perspective"
Joel Madden - "Fatherhood has given me a different perspective"
Joel Madden recently spoke out about his family life, Children and work commitments. 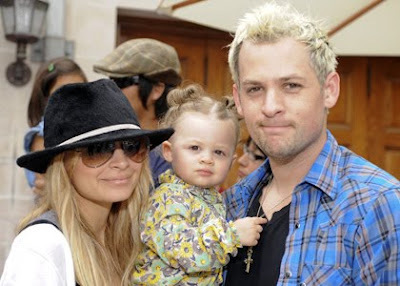 As many of you know Joel Madden and Nicole Richie welcomed their first son Sparrow James on the 9th September 2009. "It's cool, I'm excited - a little man," Madden told AAP from Los Angeles. Madden and his Good Charlotte bandmates are due to fly to Australia in October to play at the Megarampage BMX and skate event in Melbourne. Good Charlotte will be one of a host of bands rocking out at the event, including The Offspring, Wu Tang Clan and Cog. Madden said not only was he not worried about leaving his new son to play the gig on October 31, he was looking forward to catching up on some sleep while away. "Believe it or not the time you want to leave is within the first year because the baby doesn't really care what's going on," he said. "It's tougher for me to leave my daughter, who's almost two, because she actually gets it now. "When I'm even gone for the day, if I'm working, or if I'm gone for the weekend when I travel for a show, she'll call." "The baby, I don't think he'll even know I'm gone until a year or so. And when you travel is when you actually get all your sleep." Good Charlotte are currently working on their sixth album, which is called Cardiology, and is due out around March or April 2010. Joel Madden said it was a very personal album, and one that had been influenced by his experiences of fatherhood. "I think fatherhood has given me the confidence to say exactly how I feel without fear of any kind of criticism," he said. "I really don't care anymore. I don't have anything left to prove to anyone. "I think that's what fatherhood has given me - a different perspective." Aww, i really feel for Joel as Harlow does now realise when her Dad has gone out of town but i'm sure she is super excited when he returns home. I think it is great that his children has given him the freedom to be who he wants to be. Joel and Nicole really do have THE perfect family!